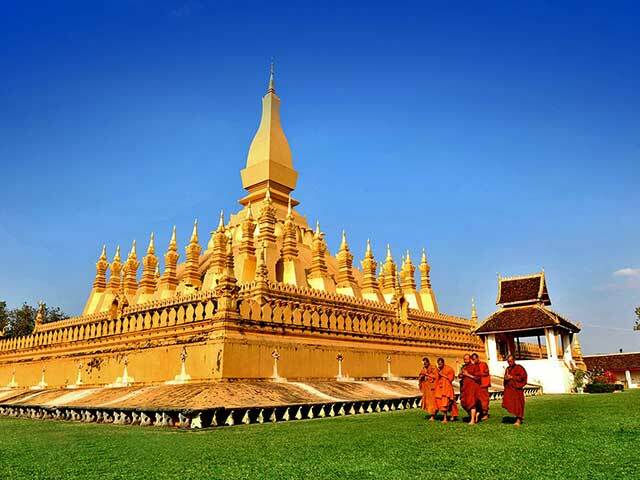 Visit the historical sites of Vientiane Capital and the Plain of Jars in Xiengkhuang. Welcome to Laos - Vientiane Capital. You will be transferred to hotel and after a short rest, we see the major sights of the capital including the oldest Wat Sisaket, the temple with thousands of miniature Buddha statues and the former royal temple of Wat Prakeo, which previously housed the famous Emerald Buddha Image. On the way to Lao’s national precious heritage, the famous and sacred structure of That Luang Stupa, we stop en route to take some pictures of the imposing Patuxay Monument, which is well known as Vientiane’s own Arc de Triumph. Enjoy the sunset by the Mekong riverside and overnight in Vientiane. 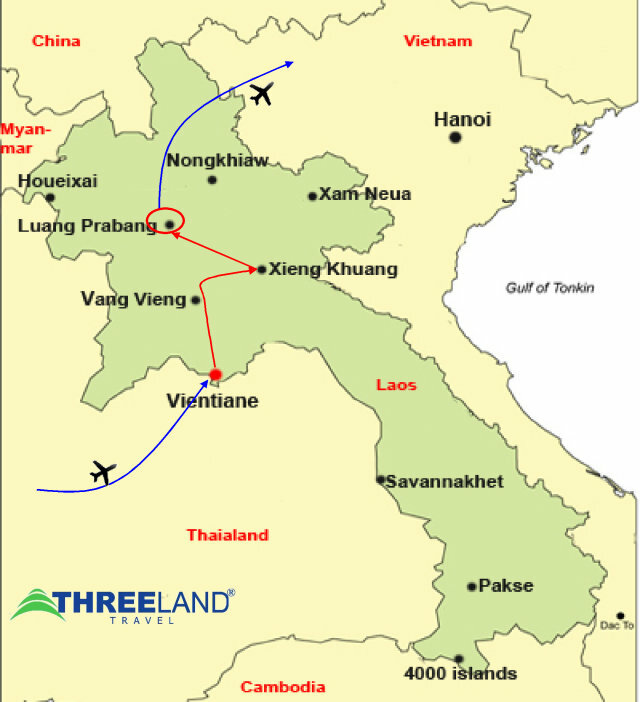 We take a short flight to Xiengkhouang, a Northeast province of Laos which was devastated by American bombing between 1964 and 1973. Upon arrival, we will visit the Plain of Jars, an impressive archaeological site where hundreds of large stone jars are littered all over the plateau. We also explore the old capital of Muang Khoun province and the nearby villages, home to the Hmong hill tribal people who have an interesting local culture and a rich history. Early morning, we visit the central market of Phonsavanh ( XiengKhouang ) to enjoy the activities with different hill tribal people barter and exchange merchandises. We then leave this small town to Luang Prabang, en route we stop off to see the Buddha images in Thampra, a site more than 200 years old, and at various villages of Hmong hill tribes along the way. People are really nice and friendly to welcome you to their villages. We continue driving uphill, enjoying the splendid natural scenery of the mountains, the forests and landscape. After a tea or coffee break at Sala Phoukhoun, where the borders of three provinces: Vientiane-Xiengkhouang-Luang Prabang meet as a T-Junction, the journey will take us over mountainous regions until we approach Luang Prabang - The Unesco World Heriage. 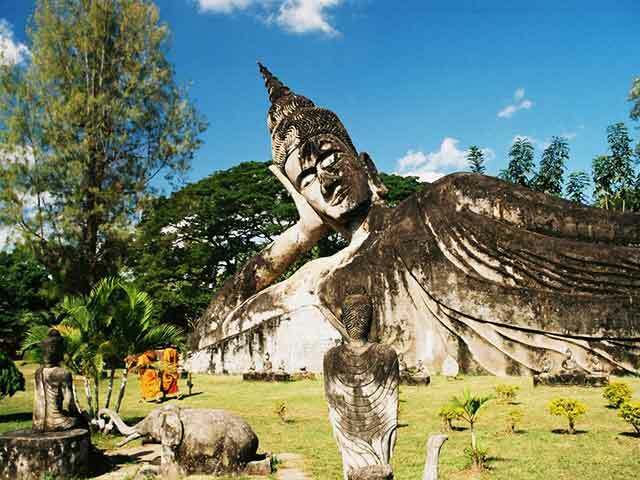 The tranquility and charm of this town with its splendid natural scenery and cultural sights make it one of the most delightful places to visit in Laos. After check in hotel, if time permits, we visit the impressive stupa of Wat Visoun and the shrine of Wat Aham, Wat Mai. We then climb up to the top of Mount Phousi to explore the sacred, gilded stupa as well as capture a beautiful view of the city and the Mekong river at sunset. We will spend time at the night market, where you can browse a lovely selection of handmade textiles, made by the local people and hill tribe people surrounding Luang Prabang. Today, we enjoy a short-guided tour of the city’s oldest temple, Wat Sene and the magnificent Wat Xiengthong with its roofs sweeping low representing the classical architecture of Luang Prabang. We then embark on a boat journey upstream along the Mekong river, which also gives us a beautiful view of the tranquil countryside as well as an interesting visit to the mysterious Pak Ou caves, two linked caves crammed with thousands of gold lacquered Buddha statues of various shapes and sizes left by pilgrims. En route, we stop at the village of Ban Xanghai, where the local specialty of rice wine is produced. On our way back to Luang Prabang we take a short drive to Ban Phanom, a village wellknown for its hand weaving. After breakfast we visit The national museum (close Tuesday) at the former Royal Palace, which displays a lovely collection of the artifacts reflecting the richness of Lao culture dating back from the days of the early kings to the last sovereign. Our tour guide will take you to airport for onward flight. End of services.